Little Bunny Foo Foo hopped into my kitchen today and landed in some carrot cake doughnuts while looking for something to eat. Thankfully, they were baked doughnuts so there was no hot oil involved! 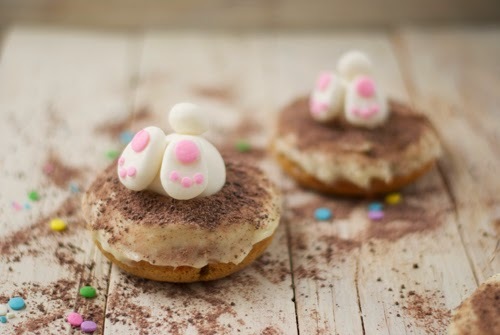 Want to make your own bunny in a garden doughnuts? The instructions are below, and it's actually pretty easy. Just make the doughnuts, the icing, the bunny bums, and then plop it all together. They're the perfect treat for little (and big) kids for the long, holiday weekend. Work your gumpaste with your hands until it's pliable. How much you use will depend on how many bunnies you're making. For one bunny, about 2 square inches of gumpaste will work. Separate enough to make two feet and a tail, and set it aside (be sure to cover it so it doesn't dry out). Roll the remaining gumpaste into a ball. This will be the bunny body! Place it somewhere safe for now. Grab the gumpaste you set aside for the feet and tail, and divide it evenly in three pieces. Form one bit into a little bunny tail ball. Form the other two pieces into paws. Set everything aside to chill out for now. Dye a small amount of gumpaste pink. Separate tiny pieces, roll into circles, then flatten for the soles of the bunny paws. Attach to the gumpaste feet with water or a food safe adhesive. Attach everything else to the bunny bum. You're done! 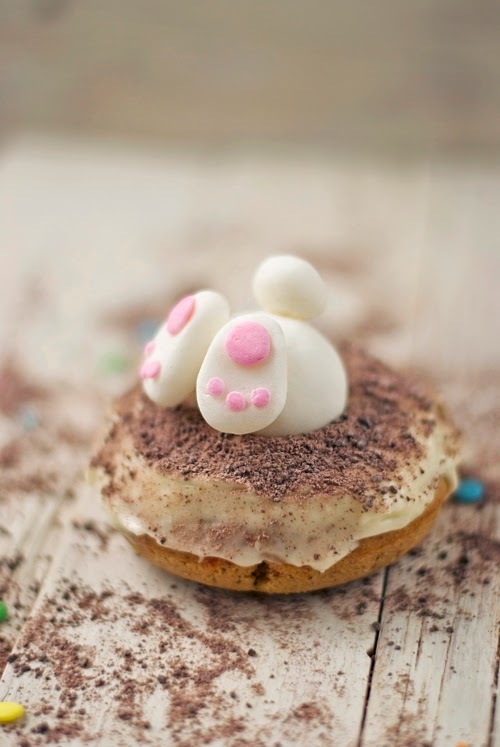 Place the bunny, bum up, in the hole of an iced carrot cake doughnut. Preheat oven to 350F and grease a standard doughnut pan. Set it out of the way for now. Combine the flour, sugar, baking powder, salt, and spices in a medium bowl. Set aside. Combine the butter, eggs, milk, and vanilla until well blended. Add in the dry ingredients , give a quick few mixes, then add the grated carrots. Mix everything until well combined. Spoon the batter (or use a pastry bag) into the greased doughnut pan and bake for 8-13 minutes. In the bowl of a stand mixer, whip together the butter and cream cheese until smooth. Add in the icing sugar and vanilla, and stir on high until creamy. Add more sugar, if desired. Use a spatula or knife to spread onto the doughnuts. Chocolate Dipped Cookie Pops... with sprinkles!